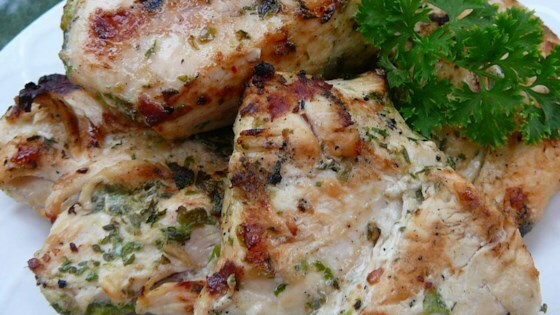 "Parsley, sage, rosemary, and thyme combine with garlic and spicy habanero pepper for a chicken marinade you'll want to sing about!" Pour the wine and olive oil into a mixing bowl. Add the minced habanero pepper, garlic, parsley, sage, rosemary, and thyme; whisk until evenly blended. Chef John's all-time favorite Thai dish! To use the marinade, place chicken into a large zippered plastic bag. Add marinade. Zip bag, forcing out as much air as possible. Refrigerate for four hours to overnight. Definitely short on flavor......would not make again.